Manchester United will look to continue their impressive form when they take on Arsenal in the pick of the FA Cup fourth-round ties at The Emirates Stadium on Friday night. The Red Devils have won seven straight matches under Ole Gunnar Solskjaer and will be confident of winning the game against their Premier League rivals. Solskjaer is not expected to make many changes to the team that defeated Brighton last time out. The teams are meeting in the FA Cup for the 15th time, with both teams winning 7 games apiece. Here is our probable lineup for the game against the North Londoners. David De Gea is in the form of his life at the moment, making jaw dropping saves game after game. He should get to play this game given the importance of how this competition could define United’s season. Ashley Young continues to play well despite his advancing years and should retain his place on the right side of defence. Eric Bailly has been linked with a move to Arsenal this month but should get to play against them alongside Victor ‘The Iceman’ Lindelof, who has looked the part this term. The former Benfica defender endured a difficult start to his Old Trafford career but has come on in leaps and bounds after settling down at the club. Luke Shaw has rediscovered his form and is expected to start at left back. Solskjaer is expected to keep the faith with his favoured midfield trio of Paul Pogba, Ander Herrera, and Nemanja Matic. All three have rediscovered their best form and have been a vital part of the team’s resurgence, helping to dominate opposition teams and linking up with the attack, providing goals and assists. 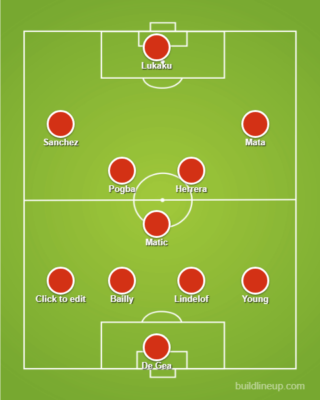 Matic and Herrera will provide cover for the defence while Pogba will play at the top of the triangle. On the left, Alexis Sanchez should come in and play against his former club having just recovered from injury. On the right, Juan Mata should come in, having struggled for game time under Solskjaer. Upfront, Romelu Lukaku is expected to come back in having lost his place to Marcus Rashford.